Sanju is a blockbuster, but did it get its facts right? 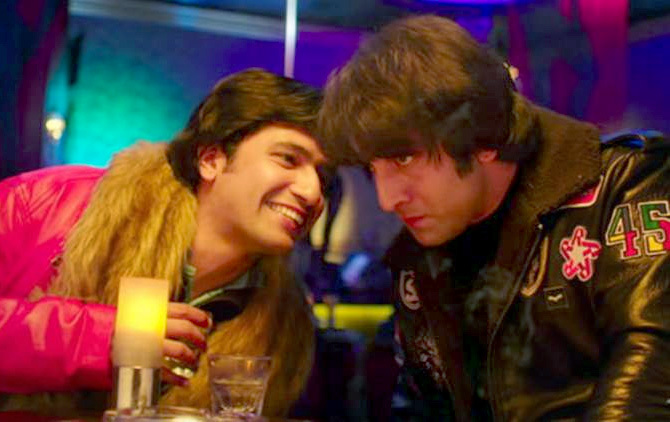 Syed Firdaus Ashraf reveals seven facts Director Rajkumar Hirani overlooked in Sanju. As a child, I never understood the meaning of this earthy Indian proverb. But after watching Rajkumar Hirani's Sanju, I finally understand what it means. The film puts the media in the dock as if it is responsible for everything that went wrong in Sanjay Dutt's life. Here are seven facts I believe Hirani ignored in Sanju. Sanju Says: There is no friend like Sanjay Dutt and he proves that by showing what a loyal friend he is to Vicky Kaushal's Kamlesh Kanhaiyal Kapsi. The Truth: Sanjay Dutt put several friends in trouble. He gave theatre owner Ajay Marwah a 9 mm pistol during the 1993 Mumbai riots. Marwah had to make rounds of the TADA (Terrorist And Disruptive Activities (Prevention)) court for 13 years before being acquitted (external link). Another friend, Yusuf Nalwala, was sentenced to five years in prison for going to Dutt's home, taking the AK-56 and disposing it on the actor's instructions. Sanju Says: Sanjay Dutt got bail, but it does not mention how that happened. The Truth: The bail did not come easily. Sunil Dutt, Sanjay's father and a Congress politician, pleaded with Shiv Sena supremo Bal Thackeray to get his son released. Maharashtra was then ruled by the Shiv Sena-BJP coalition and Thackeray ran the state government by 'remote control'. He personally intervened in the matter and had Sanjay Dutt released. The first thing Sanjay Dutt did after being released was visit Bal Thackeray's home and thank him (external link). In return for Thackeray's favour, Sunil Dutt did not contest the next Lok Sabha election from the then Mumbai North West constituency. 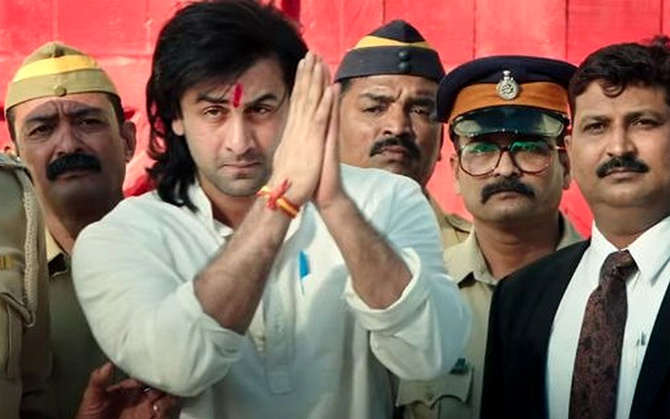 Sanju Says: A newspaper editor tells Sunil Dutt about a telephone conversation between his son and a gangster, where the latter asks Sanjay to attend a Ganpati visarjan, as if the star was being intimidated by Hindu hoods. The Truth: Sanjay Dutt was in touch with Karachi-based gangster Chotta Shakeel even after he was released on bail. In 2002, the Mumbai police taped his telephone conversations (external link) with Chotta Shakeel, where the actor is heard complaining about how Abu Salem is threatening Karisma Kapoor and how Govinda does not come to his shoots on time. Now, why would Dutt discuss such details with a dreaded gangster if he is as clean as the film claims he is? Yes, the court acquitted him of charges of terrorism, but Dutt seemed friendly with enemies of the State like Chotta Shakeel. After the Dutt-Shakeel transcripts became public, Bal Thackeray refused to help Sanjay Dutt again (external link). Sanju Says: Sanjay Dutt maintained links with the underworld out of fear. The Truth: Dutt has always been Bollywood's daredevil. When Shah Rukh Khan faced trouble in his early years in the film industry, Dutt reached out to him and took care of the problem (external link). When Preity Zinta was threatened by the underworld during the Chori Chori Chupke Chupke shoot, she made a distress call to Sanjay Dutt who always has had this 'Bhai' image. Besides, if he was so scared of gangsters, why was he shopping for them? In a chat transcript (external link), Dutt mentions a T-shirt he had bought for Chotta Shakeel! Sanju Says: Sanjay Dutt married Maanyata Dutt. The Truth: Sanjay Dutt married Richa Sharma on October 12, 1987. They have a daughter, Trishala. He also had a long-standing relationship and apparently a temple wedding with model Rhea Pillai who stood by him during his first jail stint. Hirani's movie is silent on both women. Sanju Says: Sanjay Dutt is a family man who loves his sisters. His relationship with his sisters Namrata Dutt (who is married to Kumar Gaurav) and Priya Dutt went through turbulent times after he chose Maanyata as his second (or is it third?) wife. Relations with Priya -- then a Congress MP from Mumbai -- deteriorated further after Sanjay joined the Samajwadi Party in 2009. Relations between Dutt and his sisters apparently improved after he served his prison sentence, and possibly after they were impressed by Maanyata's steadfast devotion to her husband through all those years when he was incarcerated in a prison cell. Sanju Says: Sunil Dutt was threatened by 'Mastan', a Bombay gangster who told him not to marry a Muslim woman, Nargis. The Truth: We can assume that the 'Mastan' mentioned was Haji Mastan Mirza, the late smuggler-turned-politician. Nargis had a relationship with a married Hindu (Raj Kapoor) through much of the 1950s, but no one seemed to have a problem with that. So why would 'Mastan' have an issue with Sunil Dutt marrying Nargis? Moreover, in 1958 -- the year Sunil Dutt married Nargis -- the Bombay underworld was not that powerful. Haji Mastan only gained dubious prominence in the 1960s. Besides, Haji Mastan had an adopted son, Sunder Shekhar. If he was so communal, would he have adopted a Hindu? Towards the end of his life, Mastan floated a political party, the All India Dalit Muslim Suraksha Mahasang. If he was so communal, would he form a party that went beyond Muslims, and included Dalits?